I have too much stuff!!! Certainly not the backpack it should be. Granted, my painting bits are a fair amount of it, however there still seems to be a bunch of bits. Not that I managed to throw any of it away in the move across from the apartment to the house at the UN compound, Juba 3. A bunch of new security after the Mogadishu bombing. I have set up the studio on the enclosed patio, with a fan to make it bareable. The temperatures under the metal roof are ugly. Painting at first light a must. I have my light stand for working in the evening if I can. The various bits are unpacked, the Nespresso operational, there is red wine and cheese for dinner, my jogging route measured, the shower is hot, and I even have my own gecko! No linen as yet, so I’m using my sleeping bag liner. Haven’t figured the setting on the aircon. 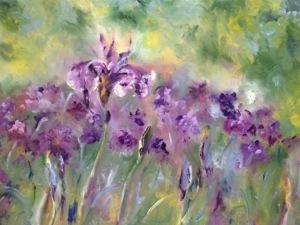 ‘Irises’, a painting from one of the many gardens in Japan. Nothing fancy, a bunch of purple smeared around the canvas, creating an undemanding, restful, painting. A quick hop across to Nairobi for meetings. The trip through the city to Tribe no less harrowing for its familiarity. Nairobi also gave me the chance to get linen for my bed at Juba3, as well as few necessary supplies, such as cheese. After lunch with Chiba, I stumbled across a deli called Prime Cut at the Village Market. Splendid! Mature cheddar packed for its journey across to Juba Town. As I was concerned that with my early departure to get ahead of the traffic, I would leave it in the hotel fridge, I parked my shoes at the fridge as a reminder. I was ready to head out the door and only when I turned to find my shoes did I remember the cheese. The affects of the wine from the dinner we had?? At the office in Nairobi, I bumped in Simonetta who I had last seen in Kabul. With Gerard in there for a course and Chiba, on route to Canada, we managed a lively, fun evening, not bothering to solve anything. I have changed my exercise schedule, as getting in a jog before heading to the office was uncomfortable given the need to leave early to be across town ahead of the traffic. A bit nuts trying to squeeze everything into the first 2 seconds of the day. For now, the early evenings are cool and there are no traffic issues running the circuit around the compound. The fairies have been to clean the place.